Invista, owner of the Lycra brand, and an innovation leader in the legwear segment, marked the brand’s 60th anniversary with the fifth edition of Lycra Fiber Moves conference in Lake Como, Italy, last month. Held every two years, this exclusive event attracts around 200 representatives from leading knitters, coverers, distributors, brands and retailers to learn about new market insights and trends, as well as Invista’s latest technologies for socks and hosiery. 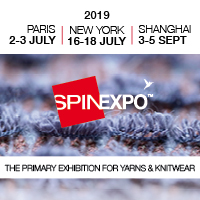 Knitting Industry spoke to Robert Kirkwood, Executive Vice President – Technology and Marketing, Invista Apparel & Advanced Textiles, during the event, about the success of the Lycra brand, its current mission and the changing markets. How would you describe the success of the Lycra Brand in the past 60 years? Robert Kirkwood: I think the secret to our success have been driven by two main factors. One is that we’ve been constantly innovating across all the segments that we support – not just in hosiery, but also in denim, intimate apparel, swimwear and activewear – constantly working with customers, talking to consumers, understanding their unmet needs and then working to satisfy them. We then combine that knowledge and innovation with our brand and marketing platforms to not only help sell the products to the apparel value chain, but to the consumer. We can help brands and retailers tell that story, so then when the consumer is walking into the retail store or looking online, they understand what’s different about this garment, why it is more comfortable, why it fits better and performs better. It is really those two pieces together that make it work. How important is the feedback you receive from the consumer? RK: The consumer is where we start. We talk a lot to our customers, but we also invest significantly in our own consumer research to really understand the market. When we do that, we learn all types of things about what consumers like about the clothing they wear and what they don’t like. And even though we are not in the position to satisfy all those needs because we are not a fashion company, it is our job to address those we can, which are primarily are around issues like comfort, fit and performance. What Lycra technologies are the most popular right now? RK: We have a number of different technologies in each of our markets. In denim, our Lycra dualFX technology is really driving the super stretch denim trend. In swimwear, our Lycra Xtra Life fiber continues to grow and is a key component of the really adds to that whole durability story in swimwear. In activewear, we have a technology called Lycra Sport technology, which balances comfort and performance, so that your activewear is both comfortable to wear but still has that second-skin feel that you want in activewear. And then you’ve heard, and we will hear more about all the new innovations we have to offer in hosiery today. You have labs based in the US, Italy, and recently you’ve opened a new innovation centre in China. There is also one in Taiwan. Why is it so important to drive innovation? RK: We think the labs are a critical part of what we do, because that’s how we stay connected to our customers, whether that’s a brand retail customer in New York or Milan, or whether that’s a fabric mill in Italy Germany, or China, or a sourcing office in Hong Kong – we work with all points of the value chain and that’s why having the labs in multiple locations is really important because we can talk directly to all our customers, see what they need, and respond to those needs. And then, when we roll out new innovations, we bring all those customers to our labs to explain the new innovation to them and work with them to see how they can fit that innovation into the lines they are developing. Is there a difference geographically in demand for different products? RK: Not necessarily. We see demand across all our segments. Each of the labs have their own specialty, so, for example, our lab in Italy is more involved in most of our hosiery developments, but they all have the capability to work in any of our segments – from denim, to activewear, to hosiery. What future technology trends influence your product development process? RK: I think there are a couple of important trends to note – the first one is sustainability and all the different aspects it brings. We think about it in terms of how we operate our manufacturing plants and the products that we produce. We put a lot of effort into making sure all our manufacturing plants work towards reducing waste, emissions and water usage. Another thing that we then look at is developing products that run more efficiently in textile mills, so that they produce less waste and need less water to process fabrics, for example. We are also investigating more sustainable raw materials – whether that’s bio-based raw materials, or recycled raw materials. The second trend that is impacting us is the idea of customisation. Everyone wants clothing that fits them, and so we are in the process of developing technologies that will allow mills and garment designers to create garments that fit people over a wider fit range, so it really feels like that garment was designed for them. We think this idea of “customization” could be the next big idea in apparel. What are the segments that you think are more promising or challenging for the future? RK: Hosiery is obviously the one where there are a lot of challenges. It is a fairly stable business for us now that the years of decline are over, but the challenge is how we can get new generation of consumers interested in wearing hosiery – whether it’s for every day or for a special occasion. The other segment that is really growing for us is activewear. Around the globe, there is growth in number of people wanting to be active, and there is also an interesting statistic about people who buy yoga pants and never do yoga. People now are buying activewear to go to the gym or just walk their dog. Other segment that is also successful for us is denim. And we have a lot of technologies we’re working on in this area, not only to offer comfort and fit, but also to help you stay cool or warm; it’s called also performance denim, which builds on the athleisure trend. And probably the segment that’s undergoing the biggest change for us right now is intimate apparel. There’s an intersection of activewear and intimate apparel in terms of what women and men are wearing. What they were all wearing five or ten years ago is different than what they prefer today. So for us that’s exciting and offers a great opportunity to look at how we can use our products to try to improve those garments’ designs. How would you describe Invista’s mission now, in 2018? RK: I think today what we’re really focused on is working with customers across the entire global value chain and our belief is: If the customer’s business is growing, then our business is growing, and that’s a win-win for both of us.